Vendio is a simple yet powerful eCommerce platform that you can use to reach buyers and sell stuff on multiple channels. Created with small businesses in mind, Vendio lets you create a cloud-based, branded store fast and easy without programming and web developing expertise. 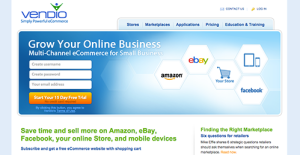 Increase exposure to buyers by selling on multiple channels like eBay, Facebook, and Amazon. Concentrate on other tasks and let Vendio do all the heavy work. Automate inventory distribution and tracking across sales channels, customer email communications, order tracking, and fulfilment. Be on top of every process of the online sales cycle and manage it all from one place. No hosting fees, no listing fees, and no transaction fees even if you’re selling from your branded web store. If you are considering Vendio it might also be a good idea to analyze other subcategories of Best Shopping Cart Software gathered in our database of B2B software reviews. Every business has its own characteristics, and may require a particular type of Shopping Cart Software solution that will be designed for their company size, type of clients and staff and even particular industry they deal with. We advise you don't count on finding an ideal software that is going to be suitable for each business regardless of their history is. It may be a good idea to read a few Vendio reviews first and even then you should remember what the service is supposed to do for your company and your workers. Do you require an easy and intuitive app with only elementary features? Will you actually use the complex tools needed by pros and big enterprises? Are there any particular tools that are especially practical for the industry you operate in? If you ask yourself these questions it is going to be much easier to locate a solid software that will match your budget. How Much Does Vendio Cost? We realize that when you make a decision to buy Shopping Cart Software it’s important not only to see how experts evaluate it in their reviews, but also to find out if the real people and companies that buy it are actually satisfied with the product. That’s why we’ve created our behavior-based Customer Satisfaction Algorithm™ that gathers customer reviews, comments and Vendio reviews across a wide range of social media sites. The data is then presented in an easy to digest form showing how many people had positive and negative experience with Vendio. With that information at hand you should be equipped to make an informed buying decision that you won’t regret. What are Vendio pricing details? What integrations are available for Vendio? If you need more information about Vendio or you simply have a question let us know what you need and we’ll forward your request directly to the vendor.